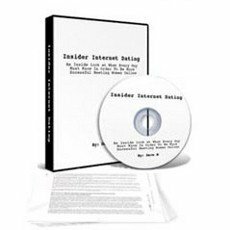 "Has Some Decent Information In Places But Is Outdated And There Are Better Products On This Subject"
Video footage that shows you the author's exact dating profile, as well as him sending out messages in real time. Doesn't solely focus on the online interaction, also covers phone game and the first date. This is an older product, so contains a lot of outdated information. Some of the advice and examples are not good. Not a lot of depth when it comes to creating messages to send out. This was one of the first products that covered online dating, and has been on the market since 2005. No doubt it was more relevant when it was first released, but now it feels really dated. It mentions a number of online dating sites that are no longer popular, and has no mention of most of the sites that are in use today. Gives you a general overview of the type of attitude you want to convey when talking to women online, as well as some examples of template messages you can send out. Most of the ideas are based on the teachings of David DeAngelo. Overall this product is somewhat limited compared to others on the market. If you're new to online dating and looking for a great place to start, we recommend you check out Click Magnet Dating. If you want something that gets a little more advanced, then The Gentlemen's Guide To Online Dating is a solid resource. Dave M is a guy who has been involved in the dating industry for a long time now, and was one of the first experts on internet dating. Most of what he teaches here in this course is based upon the principles David DeAngelo teaches. So a lot of the ideas are based around being cocky and funny, challenging women, being mysterious and not making yourself too available. It talks about making sure you don't come across like every other guy on the site and not being too easy to get. The reality is that there is a high ratio of men to women on these sites and attractive women get bombarded with messages from guys that often just get deleted. You have to do something to stand out and pique their interest, and Dave focuses on displaying attractive characteristics so women will see you as having value. The actual way the product is delivered is a mixture of audio files and screen-capture video files. The audio lessons are each on a specific topic, and are just a few minutes long each. The videos consist of Dave walking you through his profile, watching him send out messages and other things that you can see in real time. The first main thing that you'll be taught is how to create your online dating profile. Dave takes you through his own profile on Match.com so you can see word for word what he has written. There's some decent ideas in here, but nothing really new. One thing he mentions at one point is to make sure you use correct spelling in your profile and messages, but his own profile is littered with mistakes. He goes over some ideas for photos, and you can see his own photos that he has included. He shows you how he uses a photo sharing site to get feedback on a bunch of different photos, so that he makes sure he's only including the photos that make him look as attractive as possible. At times it feels like he is prescribing that you do things in the way that has worked for him, like going for the GQ look, but it might not suit who you are. For example, he says to include at least one photo of you in a business suit, but this might not fit in with the overall image that you're trying to present. Depending on which site you're using, you'll generally be prompted to enter extra information such as what you're looking for in a woman or what some of your interests are. The particulars of each site aren't covered, so you'll just have to focus on the overall attitude you want to convey and then fill in each section accordingly. There's a suggestion of a particular type of website you can check out to source good ways of describing things in your profile. I've never seen this idea before, and I can see how it could be effective if you know what you should be looking for. Dave goes through quite a few examples online and shows you how to take certain things and adapt it for your own needs, which if done right can make your profile more intriguing to women. Dave pretty much uses the same template messages to send to every woman, and has different templates for each situation. So there's one you can use for the initial message, one for if she doesn't reply back, and a few others. But what he does is pick one thing out from the girl's profile and includes that in the message, so it looks like it has been specifically written for her. I would have liked to have seen a few more examples of opening messages for the sake of variety, as well as giving you more options. There isn't really any customization of the type of message to suit different types of women, rather it's more of a one size fits all approach. Something that is really impressive about Click Magnet Dating is that they have tracked their data and show you how different styles get better responses from women depending on their age range and what they might be looking for. The initial message template is probably better than the average message most men would send out, but it's not the best example I've seen either. It's based on a template message that was made popular by David DeAngelo, and has likely been used by thousands and thousands of people now. One of the things that Dave writes in the message is about how funny he is, as women love a guy with a sense of humor. But as he points out earlier in the product, you are better off showing a woman something than telling her. He uses the example of how a rich man doesn't need to go around telling everyone how rich he is. Similarly, your focus should be on conveying the fact that you are a funny guy and let her come to that conclusion herself. The truth is that Dave is a good looking guy and has got his life together. The photos that he has on his profile have all been rated as at least a nine out of ten on the site he posted them on. It doesn't mean you have to be a good looking guy to get great results online, but if you are then most girls will afford you a certain amount of leeway when it comes to your messages. As an example, one thing that Dave does is suggest meeting up for coffee or drinks in his very first message. Some girls will make the decision right away that they want to meet him based on his photos, so it won't hurt him. But for guys who aren't as good looking, it's a better idea to just focus on getting a response first so that you have a chance to display your personality before asking her out. Dave spends a fair amount of time covering phone game, such as the best time to call and how long your calls should last. The biggest problem with this section though is that it doesn't include any information on texting. So a lot of the advice here isn't as relevant anymore, especially if you're dealing with younger women, who much prefer texting than calling. If you do end up calling though, I think most of the advice here is pretty good. The one thing that stood out as being bad information was that you should wait four to six days before calling a woman after the first date. This is taking the idea that you should be a challenge and going too far with it, as a lot of girls will simply think you aren't interested. He says it is based on interviews he has done with around 1000 women over the course of a few years, but it is based around game-playing and trying to make women think you aren't that interested. He has a point though in that you don't want to call straight away as it can make you seem needy to women. This is an example of where texting is really useful, as you can send a casual text the next day letting her know you had a fun time and it's a very low investment way to keep in touch with her. The topic of first dates is covered in some detail as well. It follows along the same theme that you're a busy, high value guy so you'll be setting dates that reflect this. Pretty much this means you won't be doing the standard first date of dinner and a movie that many guys use as a default. The options that Dave suggests are pretty much a given in the dating community, so the information isn't anything new. He gives a good overview of the character traits you want to show to women, but not a lot of detail on how to do them. The main thing he emphasizes is the importance of being funny, but with no real direction on how you can be more funny. His suggestion of buying a joke book is pretty poor, as reciting a bunch of jokes isn't the kind of humor that leads to attracting women. But there is better information when it comes to the area of getting physical. He teaches you how to set the right tone from the start of the date by selecting the right venue so that you can be closer to the girl, how to hold her hand and how to get the first kiss. As well as the advice on 'multi-dates/mini-dates' this is all pretty solid information. The other thing he goes into is indicators to watch out for that a woman might be interested. These are the typical things you see in body language books and products, and often sound better in theory than they work in practice. For example, checking to see how big a woman's pupils are to determine how interested she is, isn't that easy to do and generally not worth worrying about. For a lot of beginners, there is the risk of interpreting every little thing a woman does as a sign that she isn't interested and can create a negative feedback loop. Another bit of advice that was made popular by David DeAngelo and is mentioned here is not to smile too much when on the date. The idea behind it is you don't want to appear to needy, and that you'll be conveying that she needs to work for your approval. There are dating coaches who teach this, and those who teach that men need to smile a lot more, and there is no right or wrong way. The important thing is that you're being congruent, and behaving in a way that fits your personality. It's not really correct to give everybody the same blanket advice, as if to say 'this is the right way of doing things'. Some of the best guys I know with women are smiling all the time, so focus on what feels natural for you. The main issue with this product is just how dated it is. Especially as technology is advancing at such a fast rate, the online dating world is constantly in flux. One of the sites that Dave talks about is Yahoo Personals, which doesn't actually exist anymore. The main site that Dave navigates you through is Match.com, but which has been comprehensively upgraded since this product was created. The other main sites that are popular these days aren't mentioned at all, as they likely didn't exist back then. You'll also see a tip which is that you have to include a sneaky way of including your email address at the end of the message so that women can message you back. The reason for this is that the site would block messages that included direct contact information, and people couldn't reply to your messages unless they paid to become premium members. This was good advice when it was written, but is terrible advice if followed today. The way online dating sites are generally set up now, women can respond to any messages you send them. By including your email address, you actually look like you are a spammer phishing for email addresses, and you have a lower chance of getting a reply, and a higher chance of getting your profile deleted. It's okay to exchange contact information after a couple of messages, but if you send it out unsolicited it can be seen as a potential red flag by the women you're messaging and by the site itself. You're also giving women the impression that you're happy to send your contact details out to just anyone, and she hasn't had to do anything to earn it.